MDX makes setting new standards look easy, but it took lots of meticulous planning and ahead-of-the-curve engineering to craft the award-winning luxury crossover, and it's unmatched by competitors in several areas. 2016 Acura MDX reviews say it continues to be one of the best-looking, most tech-savvy and most fun-to-drive three-row SUVs that shoppers can find on the market today. Come test drive the 2016 Acura MDX in Arlington and experience its effortless utility and excellent host of technologies. When you step inside you'll be cocooned in luxury. The interior is nice and quiet, visually attractive throughout and equipped with many appealing amenities, including cutting-edge camera-based safety systems and infotainment features. When driving in rush hour or on cross-country trips, you can feel confident that you and your loved ones are secure, especially if you select the new AcuraWatch Plus package, which debuts Road Departure Mitigation (i.e., lane-keeping assist) and rear cross-traffic alert along with other previously available systems. The package is offered on every trim level in the lineup, however even if you don't choose to upgrade MDX comes with safety built in, featuring a standard rearview camera, traction and stability control, and trailer tow stabilization on all-wheel-drive (AWD) models. Refinement isn't just found in the cabin and elegant exterior design, but also in the SUV's sophisticated performance. 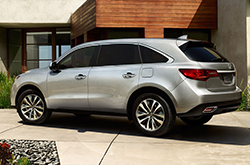 MDX provides a smooth ride that soaks up potholes, bumps and other roadway deficiencies, but also bares its muscle with the ability to tow up to 5,000 pounds when properly equipped. 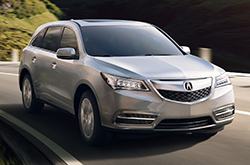 Powering the 2016 Acura MDX in Arlington is a 3.5-liter V-6 that generates 290 horsepower and 267 lb.-ft. of torque. When paired with this year's new standard nine-speed automatic transmission it delivers respectable fuel economy ratings whether you have front- or all-wheel drive. Besides this, drivers can expect more than solid efficiency, power and minimal road noise. This is an SUV that offers the reward of "responsive steering and composed handling" according to Edmunds.com's 2016 Acura MDX review. Visit us soon to take a spin and be sure to bring the whole family along so you can try out features like the easy sliding and folding seats, tri-zone automatic climate control, innovative smartphone-capable features and other useful amenities. Thanks for choosing vandergriff Acura as your resource for 2016 Acura MDX reviews and comparisons. As the prominent Acura retailer in Arlington it is our job to present our customers with reviews transcribed by the finest Acura writers around. Once you start reading, you'll find that this article is bundled with vehicle specs in a clear layout that's easy to read. Use it to get the info you need to make an informed purchasing decision. Not sure if the MDX? is suited for you? Check out our online research library to read more Acura reviews and to compare vandergriff Acura's models to vehicles from other auto manufacturers.